A high-speed fibre broadband connection is one of the key factors people consider when buying or renting a property, according to a Staffordshire estate agent. With nearly 13,000 homes across the county changing hands during the last 12 months, faster broadband connectivity for things like on-demand video, online gaming and smart home apps is more important than ever. Across Staffordshire, more than 75,000 homes and businesses can now benefit from faster speeds thanks to the county council’s £32 million Superfast Staffordshire partnership with Openreach. And it’s proving popular as well, with more than 50 per cent of premises already having contacted their service provide and switched to a fibre connection. Jamie Smith, an estate agent with Stafford-based Clothier and Day, said: “Superfast broadband connection certainly adds appeal to a property. Home owners should certainly think about getting connected. Superfast broadband is now considered as an important feature in the home, enabling people to access a range of leisure, education and other services and to work flexibly. In some areas where mobile phone signal is poor, a superfast broadband connection can also offer an alternative communication option. The most recent areas to benefit from the Superfast Staffordshire rollout include Great Chatwell and Standeford in South Staffordshire, Park Nook (near Ipstones) in Staffordshire Moorlands, Shenstone Wood End and Little Hay in Lichfield and Croxton in Stafford Borough. Staffordshire County Council’s economic growth leader, Mark Winnington, said: “We have now passed the 50 per cent take-up mark which is another significant milestone for the programme. We are now urging more people to get connected and improve their day-to-day living through better access to a range of services. It’s further good news for the area after it was announced, earlier this year, that Openreach, the UK’s largest telephone and broadband network, is recruiting around 200 new trainee engineers across the West Midlands, including 20 in Staffordshire. 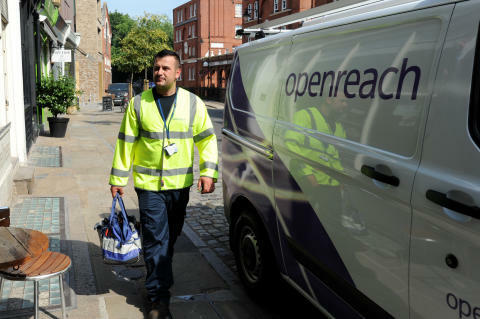 Carl Sproston, Openreach’s partnership director, said: “We are delighted so many people are using fibre across Staffordshire. Our partnership has been a real success story so far, but we know there is still more to do. We’re now working in some of the most rural parts of the county, but our engineers are highly-skilled in overcoming the challenges this brings. Across the county, according to independent thinkbroadband.com, more than 95 per cent of premises are able to order superfast broadband.